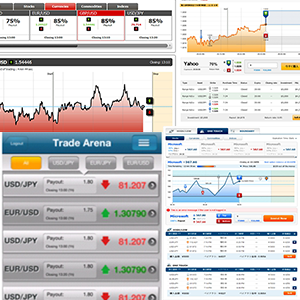 The leading streaming engine for Trading Platforms, Binary Options, FX, CFD, and Spread Betting. Financial services that require web, mobile, and tablet-based real-time data distribution need to offer a high-quality service, comparable to that of traditional solutions on the trading floor. They must provide similar features such as low latency, secure access control, reliability, and scalability, but with the lower cost point provided by Internet-based distribution. New standards such as WebSockets are not enough, alone, to provide a complete reliable solution based on publish and subscribe. WebSockets simply provide a low-level transport, but all the messaging logic, the fan-out algorithms, the adaptive throttling mechanisms, and the recovery procedure are not part of the WebSocket specification. Push low-latency live financial data to any web, desktop, mobile, or tablet application, and orders from clients to the server. This means Lightstreamer is the ideal choice not only for streaming live data from the server to the client, but also for submitting orders from the client. Low-latency guaranteed in-order delivery is supported across all the client platforms. Lightstreamer can modulate the bandwidth required to push data as a function of the available bandwidth at any instant. Whenever the network quality decreases (e.g., congestion), Lightstreamer reduces the update frequency through heuristic filters. In this way, the user always receives new data, independent of the connection speed available at any moment. Lightstreamer can traverse any possible kind of firewall and proxy to guarantee real-time responsiveness and low latency any time. Lightstreamer can be integrated on pure HTML applications (on any existing browser, both for desktop and mobile) but also any native client technology (such as Android, iPad, iPhone, etc.). Web Financial Group deployed Lightstreamer for market data and news streaming, and for real-time updates of clients' portfolios in an innovative HTML5 financial services framework. Read the interview with Director/Global Sales at Web Financial Group. Companies in the financial services industry using Lightstreamer include: Morgan Stanley, Bank of America, JP Morgan, UBS, Societe Generale, UniCredit, DNB, Fannie Mae, Fidelity Investments, and many others (for a partial list, see the Customers page). Lightstreamer can manage the entire data transmission system of mobile, web, and desktop applications, from single dealer platforms to complex FX trading solutions. 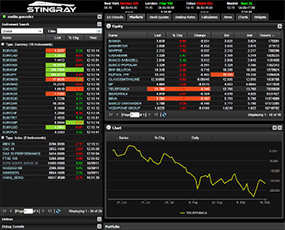 Lightstreamer can be integrated in any Spread Betting platform to push real-time prices, deal confirmations, and chart price updates, thus guaranteeing an efficient service. Lightstreamer can be integrated for data delivery with low latency on all major browsers and devices. Perfect for real-time data updates and fast order executions. When traders' positions are replicated by a great number of followers, portfolios become large and complex to be effectively updated in real time. Lightstreamer can be integrated in any social trading platform as a scalable live data streaming server, even for mobile apps. eToro is the world's largest social investment network. eToro is focused on opening up online financial trading (currencies, ETFs, commodities, indices and Stock CFDs) to everyone. Clients allow their trading activity to be published on the network along with their trading history and performance metrics. Users leverage this wealth of financial information and choose to copy other traders. eToro opted for Lightstreamer for cross platform, low-latency messaging, including price ticks, rates and operational messages, for a large number of concurrent users. 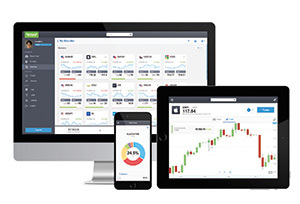 The eToro platform is available on web, iOS and Android. "For its reputation in the financial industry, choosing Lightstreamer was a no-brainer for us, and we had an extremely positive experience working with it. The product simply works and delivers on its promise. The support staff is very professional and responsive, and give us a great contribution in both helping us design the best integration model as well as helping us troubleshoot challenges" said Israel Kalush, VP Engineering at eToro. "As Lightstreamer is pivotal in our overall offering, the Lightstreamer support team was a key factor in our success." IG began its activity in 1974 as the world’s first financial spread betting company. In the first half of 2012, IG Group recorded GBP 366.8M in trading revenues. With offices in 14 countries across five continents, they execute more than five million transactions a month for over 140,000 global clients. Lightstreamer is used to provide streaming of prices, charts, and deal confirmations to all the dealing platforms. "In our experience, Lightstreamer has repeatedly demonstrated their in-depth expertise in streaming over the web with deep knowledge of the difficulties one faces," said Ivan Gowan, IG's Head of IT Development. "Our experience of Lightstreamer support has been very positive, they have set a high bar for other vendors to strive to achieve. Responses to questions about our design or rollout as well as support issues have been very prompt and detailed. They are very proactive in helping to resolve issues." 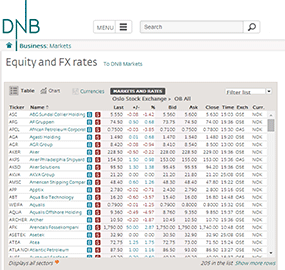 MarketsPulse, a leader in Binary Options enterprise solutions, relies on the Lightstreamer engine to push real-time data to and from browsers and apps, both on desktop and mobile. MarketsPulse's financial data is instantly accessible from anywhere, thanks to its innovative trading platform, which features low latency, secure access control, reliability, and scalability. Several world-class binary options platforms are powered by Lightstreamer, including FXTrade Financials (Japan) and Opteck (EU), MarketsPulse clients. "The Lightstreamer application allows us to offer the kind of secure, scalable, and reliable experience our Enterprise financial customers need," said Rachely Esman, CEO at MarketsPulse. "Our cooperation with the Lightstreamer company and usage of their technology has played a large role in our leadership of the competitive Binary Option technology market."